The # 4 task in Jen's Take A Chance Challenge was to Judge a Book by Its Cover. As I mentioned in this post the task wasn't as easy as it seemed. I had to choose a book based on its cover and write a post about what I think the book is about. Then, and only then read the back cover or the book jacket, read the book and post if my assumptions based on the cover is correct. My assumption about the story based on the cover was: A mystery obviously. A woman vanishes in the middle of the city. Mississippi perhaps because the street looks like its paved in cobblestones. Did she run away from an abusive or mob type husband. Or was she spirited away by someone out to get back at her family or for more nefarious reasons. I was completely wrong, except for the mystery part. Front Flap: "Lauren Heller and her husband, Roger, are out to dinner one night when they're brutally attacked. Twenty four hours later, Lauren awakes in the hospital to find that her husband has vanished without a trace. The only one who has any chance of finding him is his brother, Nick, a high powered investigator with a private intelligence firm. Nick Heller is touch, smart, and stubborn. Trained in the Special Forces, he specializes in digging up secrets that powerful people would rather keep hidden. He and his brother have been estranged ever since the imprisonment of their notorious billionaire father, but Nick will do anything to protect Lauren and her son. He never backs down. Even if it means taking on the most lethal enemies he's ever had to face. Plunged headlong into a desparate chase, Nick begins making shocking discoveries about his brother's life--and about the giant defense contractor he works for. Now, in order to keep Lauren and her teenage son alive, Nick must take on a powerful and deadly conspiracy that will stop at nothing to protect its secrets." Nick's nephew, Gabe, calls him in a panic one night. His mom is in the hospital unconscious, his dad is gone. They need him. He flies to Georgetown and gets involved in a convoluted series of events that combines the case he had been working on with his efforts to find Roger. The story is well written, fast paced and interesting. 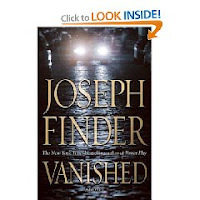 Considering that this was the first time I've ever read anything by Joseph Finder and it was a random choice based on the cover, I found myself pleasantly surprised and enjoyed the story. I'll be on the lookout for more stories by Finder. The hero, Nick Heller, is a funny guy and likable guy with an ability to play the game but not be in the game. This was a good read!" "Any thriller that uses Dean & Deluca's celebrated chocolate chip cookies as an investigatory tool deserves kudos for cleverness." "Cliffhangers galore, the fascinating trade craft of corporate espionage, and an engrossing story will propel readers through this outstanding thriller. Highly recommended as a great summer read." I love the fun of having to judge the book by its cover!!! Sounds like a great read too!! How fun Good job on picking well. I really should have signed up for that challenge. It is hard to pick out a book based only on the cover. And I think you did a good job guessing what it might be about! The book actually sounds kind of good ... and I'm glad it worked out for you!